Happy New Year everyone! Where did this year go? It was so packed with projects, memories and a few challenges thrown in. As many of you know, I started this blog in late March. It has been the best nine months of my life when it comes to feeling excited to get up everyday and design, create and make projects to share here in blogworld. I have big, big plans for 2014 but to look back for a minute, here are three fun highlights I want to share with you. . .
• In 9 months I have created 78 tutorials, shared my 4 video tutorial (wishing that was 32 videos. . . but next year). Here is a fun visual on Pinterest. • In 9 months (as in 36 weeks or 273 days) I have posted 200 original posts. I just love you guys and can’t stay away! • My most Pinterest pinned post is the first of the paper feather series with 101,000+ pins. Holey Wow! I have been a busy girl indeed and it is often a a challenge to stay organized. Two ways I like to keep thing in order is with my clipboard wall and my printable monthly calendar. This year I designed the calendar (in a chalkboard style design) to clip vertically so it is easier to read when it is hanging on the wall. 2015 Calendar – do you have a release date? Would love to give as teacher gift this week. Sorry, I am in the middle of crunch time and haven’t had a chance to finish it. I gotta say i’ve been using this calender for the whole year and it’s super super super awesome, so thank you for that! are you gonna do a 2015 version? Yes we are! Coming right up! I’m so excited for 2015 calendar! I love your designs! I have been searching for the 2015 calendar. Has it posted yet? Coming soon:) Still finishing it up. I love it. I hope you are going to do it again next year. Yes, and we will be sharing it on black Friday! Thank you so much! I’m a little slow to the party but I’ve printed off the rest of the months. I have a magnetic chalkboard and these will be perfect to clip on there. Stay tuned for next year’s calendar! Wonderful to hear! We will have a 2015 coming up! Oh PLEASE make a 2015 version. 🙂 I love this so much and am gearing up to start planning 2015! I’ve been using your calendar all year and I LOVE IT! Yours is the first layout and design that I haven’t gotten bored with. Coming from a calendar/planner junkie that is saying something!! Keep up the fab work!!!! How come the calendar is no longer available.? Such a lovely calendar.. Love your work! Hi Jana! It is still there. Just click on the button at the end of the post. Give it a minute to load in your browser then you can download it onto your computer. Great calendars. I don’t know how I missed them earlier this year! Thank you so much for sharing! You have them for the rest of the year and. . . I will have a new set for 2015!! thank you for this! SO much better than printing out a drab calender of the computer! Thank you so much for this printable! It’s lovely. Thanks for creating this for all of us! Thank you, I am in the process of attempting to create a Direct Sales Planner Organizer for my self and I love this calendar to add to it! Great! This is a practical and usable calendar. Just found your website and love it. I found so many things I want to do, so little time. Work really interferes with my crafting. I know, right! That darn work. So happy you are here! Found you on pintrest, thank you!Thank you! Thank you! I am a mother of 5 and I can not tell you how much of my life I have wasted in front of my computer trying to create a printable calander (portrait style to boot!) that I can stand to look at! This is beautiful! I can’t wait to come back and check out the rest of your site when I have time. Thanks so much! These are just great! They will help me plan menus this year and are posted on our black fridge. Thanks for sharing them! Thanks! Love to hear how they are used. Lindoooo, muito obrigada ! Feliz 2014 ! Thanks you Adrienne! Sweet note. Love this and your incredibly creative talents! Have been a fan for months. Just added these calendars to the list on my current post about getting organized! What a great and stylish calendar! Thanks so much Lia, this is going on my office wall right away. 🙂 Congratulations on such a successful year and all the best for another one to come! Thanks Melissa! Here is to a fab 2014 for both of us!! I just discovered your site through Skip to My Lou’s printable calendar posting and I have to tell you that you’re making me so happy! I too am a paper addict and love to make hand-cut decorations. Your leaf and feather tutorials have me doing a gleeful at my computer and I’ve only just started exploring all 200 of your blogs (let alone your Pinterest pins). You’ve got a new follower (that sounds so stalky, but I don’t mean it that way 🙂 ). Thank you! Thanks so much for a wonderful year of fantastic ideas and inspiration. Hope to be able to meet you in person sometime. Thanks for the wonderful calendar. Possibly next year could you post one in November. I am sure you plan well in advance as well. Happy New Year. Yes, I was hoping to get this calendar out earlier but… sigh. 😉 Next year. Where do you live? I am hoping to do a class tour this next fall and am planning my cities. Ooh ooh, pick Atlanta, pick Atlanta! Thanks! I will keep you in mind. Thank you so much, I love this calendar!! I have been all over the internet the last couple of days looking for a printable calendar. Last year I printed out a calendar for the year and loved doing that instead of buying a huge calendar that takes up most of the space I have available for a calendar (that and printing your own is so much cheaper). The only problem was, the creator did not include holidays so I filled them in, no big deal. However, I am so thankful you did include holidays AND the Chinese New Year. Our daughter is from China, so that is always an important holiday for us as well! Thank you! Found your blog by accident and I love serendipitous accidents! Love everything I’ve seen! Pinned! And thanks for sharing all your printables Lia. Just printed these out to insert into my planning binder. Here’s hoping for an organized year. Congratulations with your first year of blogging, and with all the succes, and a good happy new year to you and your dear ones. It was a pleasure to follow you, and to read all the projects of yours. It’s still amazing how you made of nothing expensive materials such beautiful things as well in your house. Thanks Jet! I honestly think being able to make something from nothing is a gift my mother passed onto me. I was delighted to hear my daughter Emily’s New Year resolution is to create less waste. Love it. I am passing it onto her too. Yay!! Haha. No pressure right. Love to hear that my work encourages and delights. Big smile here. Congratulations on your first year! I was one of the many who repinned your feather and thus found your blog. Love your style. Thank you for all the great ideas. Happy New Year! I wish you a very very happy new year and you have everything you need to be happy. Thanks for the beautiful calendar. You did great Anna! Kisses back. Happy New Year Lia! thank you for all your work. I wish you a healthy New Year filled with love and light. Thank you so much for your free printables and ideas, and I look forward to this year’s inspired posts. Happy New Year! Thank you very much for the free calendar, your work is gorgeous and I will look forward to seeing it every day on my wall! I may even be more organized this year. Happy New Year! You are so welcome Rebecca! More organizing projects coming. Thank you for the calendar Lia! You are so talented. 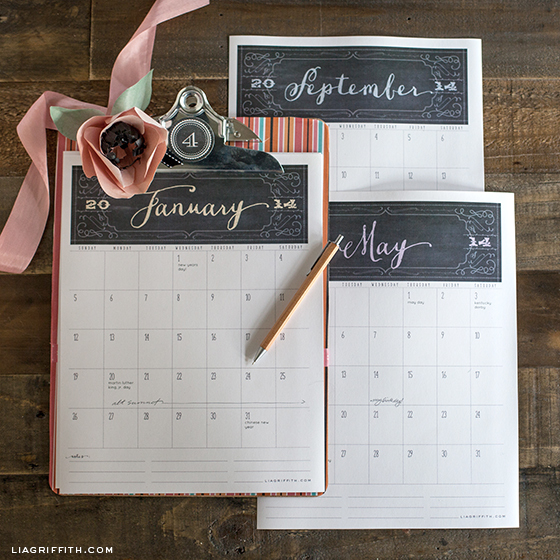 Love the font for the names of the months and would love to use it on some of my projects. What font is it? Thank Lora! (That is how my sister spells it too). The font is Dasha from MyFonts.com. I love the handwritten look. These are perfect. I bought a few clipboards tonight for these and tomorrow I’ll be printing a few sets and giving them as neighbor gifts (Christmas season was much too busy this year for me!) for New Year’s this weekend. You saved me! Thank you, thank you! You are so welcome Claressa! Thaks for all the great ideas you shared with all of us in 2013. I hope 2014 comes full of inspiration! Thanks so much for sharing this calendar! I love it! Thank you, Can’t wait to hang them in my studio. Thanks Laura! Love your work!! I think I fell off my chair when I read this thank you. You are my inspiration to do great things and that there is not limits. Awwwww. 🙂 I have made 32 paper dresses as well. Love your vision. And your peonies are my favorite. I love this calendar – but just noticed November has an error in it….. it ends with Nov. 31 but I’m still using it! Thanks for sharing! Thanks! I’m going to re-download it now! I love this calendar! Would there be any way to get an editable top graphic? I’d love to set up a weekly/daily calendar for myself, and would love to stick with this theme without asking you to do it (there are so many ways to set things up!). Thank you for the time you put into this. It’s gorgeous! The November date is now fixed. Thanks. As far as the top graphic, you might try to place the PDF pages in Word or whatever program you work in and use a white box to cover my graphic then add your own. Use my calender part as clipart. The editable dated won’t work anymore, but you can add your own in Word as well. Hope this helps. Thank You, this is just what I needed, I love it. So lovely, I just added the brazilian holidays (which are many…) Thank you and happy New Year! You are truly amazing and this is one of my favorite blogs (I’ve pinned SO many of your printables to my Pinterest boards and use them all the time)! I love your creativity and obvious spirit of giving and hope you have a wonderful & creative new year! I’m printing out these GORGEOUS 2014 calendar pages right now! Awww, thank you Donna. That just made my day! Oh thank you Lia! This is beautiful. I saved it so I could print it when everyone wakes up. Happy New Year! You are so welcome Janet!! I am just getting into making crafts of all kind. I can not wait to get new printer to try out all your wonderful things to make. Wonderful! Lots of good things coming. I love hearing that Amy! Thanks for your sweet words. Thanks so much for all the creative posts!